ROME - Five Star Movement ministers met yesterday to discuss 1 billion euro cuts to departmental budgets. The Ministry of Defence is set to take the greatest hit, as talks confirmed that 500 million euros would be slashed from their budget. Although ministers have assured that the cuts “will not be applied to staff salaries or to Italy’s internal and external security systems,” various defence measures will allegedly be suspended. 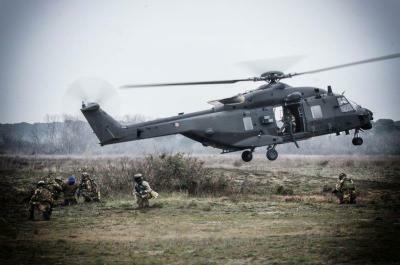 These include the use of NH-90 helicopters, saving the government 370 million euros, the use of Camm Er missiles, saving 39 million euros, and the construction of the Italian Pentagon in Centocelle, which would have reportedly cost 1.1 billion euros. During the meeting, Deputy Prime Minister Luigi di Maio congratulated Minister of the Defence Elisabetta Trenta for her recent efforts, saying, “your work has been exceptional, no other Minister has performed so well in the space of just three months.” The government’s cuts are perhaps necessary to fund pledges made by the parties in the March general election. Both the Five Star Movement and the League promised to implement anti-austerity policies, tax cuts for lower-income Italians, and high social welfare and infrastructure spending. Since they targeted the established parties for their failure to deliver on manifesto pledges, both must keep to their promises to avoid hypocrisy accusations. Despite this, Undersecretary of the Defence Raffaele Volpi is against the cuts, having called them “a burden to taxpayers.” Her disappointment may be in light of the fact that Italy’s defence spending was as high as 4.7 billion euros in 2017. Two weeks ago, the coalition revealed its plans to set Italy’s budget deficit at 2.4% of GDP. This figure far exceeds the 1.6% level lobbied for by the technocratic finance minister Giovanni Tria. It has created great tension within the EU, given that Italy’s debt stands at 132% of GDP, the second-highest debt-to-GDP ratio in the eurozone. Jean-Claude Juncker said Italy must be treated “strictly and fairly” to prevent a new crisis. He remarked, “one crisis was enough, and we have to prevent Italy from being able to get a special treatment here which, if everybody were to get, would mean the end of the euro.” Salvini responded stating that his government merely wishes to prioritize people's rights to work, security and health. However, Mattarella is reportedly against the high deficit spending. Investors too are concerned about the government’s budget plan, for many have reportedly sold off government bonds. Cuts are not only being made to Defence, but also to Italy’s Infrastructure, Justice and Health Ministries to accommodate the government's generous budget. Yet given their 2.4 trillion euro debt pile, they may need to reconsider their budget altogether to resurrect Italy's relationship with the EU.